Although Cristiano Ronaldo dismissed talk of a crisis and coach Zinedine Zidane said he is not worried, they both admitted that there's some work to do to get Real back on track. Tottenham Hotspur midfielder Dele Alli has his shot deflected off Real Madrid defender Sergio Ramos for the second goal during their UEFA Champions League Group H match at Wembley Stadium in London on November 1, 2017. Spurs won 3-1. It's only been two losses, but when it comes to Real Madrid, that's enough to put the team on the brink of turmoil. Consecutive defeats to newcomer Girona in the Spanish league and to Tottenham Hotspur in the UEFA Champions League have left the team reeling. Real struggled in both matches despite playing with its top players, prompting a wave of criticism. "We are not going to play well every time," Ronaldo said after Tuesday's 1-3 loss in England. "We have to change things and admit that we are not where we wanted to be right now." Zidane said it will take some time to restore the team's morale after the consecutive losses. "It's two defeats in a row and we can't be happy about it," Zidane said. "It's a difficult moment but you have to accept it. We have to keep our heads cool because this is soccer and we have a lot of games to play and there's still a lot of time to turn things around, and that's what we will do." Real remains in good position to advance from Group H in the UCL, and it can do it with a victory at APOEL later this month. But the team is already eight points behind leader Barcelona in the Spanish league, a deficit it has never been able to overcome. Real had won four in a row in the league before last weekend's loss at Girona, but it got off to a slow start in which it failed to win its first three home games. Real is defending both the Spanish league and the UCL titles this season. "We have to say calm," Ronaldo said. "Things are not as bad as they look. The team is not playing that badly, so we must remain confident. We have to think positively because it's the end of the season that counts, not the beginning." Zidane blamed the team's letdown on its numerous missed opportunities in front of goal. "There are moments in a season when you score goals from very few chances, and others when you struggle to do that," the former France midfielder said. "We have been creating opportunities but we are not being able to capitalize on them." Zidane said he has a group of experienced players who will be able to quickly steer the team back in the right direction. Ronaldo would have liked to see even more experience in the team at a moment like this. He said some of the players that the club let go in the offseason could have been making a difference right now, including Pepe, Alvaro Morata and James Rodriquez. "The new players who came to the squad have a lot of potential and they are the future of Madrid," said Ronaldo, who scored the team's goal on Tuesday at Wembley. "But if you ask me, every great player is always needed by a club, and Pepe was a great player, and Morata, James ... All players who have left used to make us a stronger team, obviously. 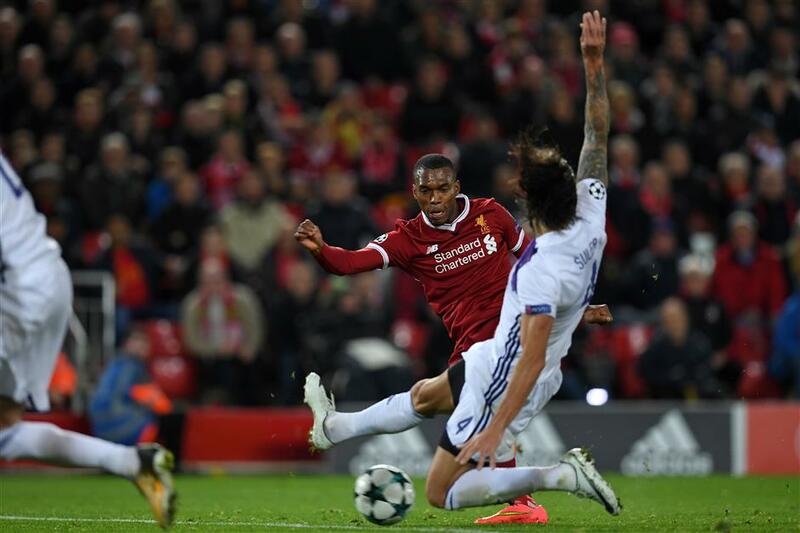 Liverpool striker Daniel Sturridge shoots to score the third goal against NK Maribor during their UEFA Champions League Group E match at Anfield in Liverpool, northwest England, on November 1, 2017. The Reds won 3-0. "Our squad isn't worse, but it's less experienced and experience is very important. But it's no excuse and we shouldn't be alarmed." The front cover of Spanish newspaper Marca on Thursday was at odds with Ronaldo's reading of the defeat. "All the alarms are going off," it said, adding "Madrid's domestic crisis is transported to Europe". Daily AS headlined its edition "Nightmare at Wembley". Ronaldo dismissed any talk of a crisis at Real, pointing to the team's enormous success under Zidane, with whom the team has won seven trophies in under two years. "People forget about the good times very quickly. I never talk of a crisis, you can lose three or four games but there's never a crisis. We can't forget what we've achieved," Ronaldo added. The other two English clubs also shone in the UCL on Wednesday as Manchester City beat Napoli 4-2 to join Spurs in secure its place in the knockout stages with two games remaining while Liverpool made it three wins from three for English clubs with a straightforward 3-0 victory over Slovenian outsider Maribor. It can qualify by beating Sevilla in its next game. City made it four wins from four with victory in Naples as it qualified for the knockout stages for the fifth year in a row. Lorenzo Insigne put Napoli ahead in the 21st minute — the first time since August that City had conceded the opening goal of any game. Nicolas Otamendi and John Stones scored for City to turn the match around, before Jorginho equalized for the hosts from the penalty spot. But Sergio Aguero's goal on a counterattack, his 178th for the club, gave him the City scoring record and Raheem Sterling added the visitors' fourth in stoppage time. Shakhtar Donetsk hasn't made it past the group stage since the 2014-15 season, but looks likely to do so this campaign after beating Feyenoord 3-1 to tighten its hold on second place in Group F.